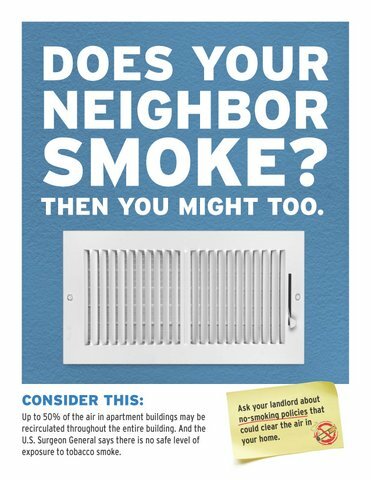 New Colorado data show that more than half of the state’s residents in apartments or attached housing are still exposed to unwanted, toxic secondhand smoke. Previous studies have shown that more than 85 percent of Coloradans don’t allow smoking in their homes. Smoke can travel through ventilation systems, pipes, walls, windows, doors, electrical sockets and floors. Ventilating and cleaning the air will not eliminate secondhand smoke exposure. According to the new Colorado Department of Public Health and Environment data, exposure to secondhand smoke is high in multi-unit housing among all socioeconomic groups in Colorado. Secondhand tobacco smoke contains poisons and causes heart disease and lung cancer in non-smoking adults and is a known cause of sudden infant death syndrome or SIDS, respiratory problems, ear infections, and asthma attacks in infants and children. There is no safe level of secondhand smoke. Even brief exposure to secondhand smoke can trigger heart attacks. Research shows smoke-free policies have a positive ripple effect. Prohibiting smoking not only reduces exposure to secondhand smoke but is also linked to a decrease in consumption of cigarettes and an increase in quitting smoking.